Yellow journalism is a pejorative reference to journalism that features scandal-mongering, sensationalism, jingoism, or other unethical or unprofessional practices by news media organizations or individual journalists. 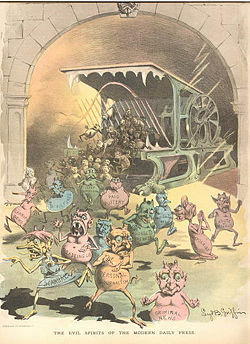 Coined in the 1890s to describe the sensationalist tactics employed by Joseph Pulitzer and William Randolph Hearst in their competition over the market for their rival New York City daily newspapers, yellow journalism faded in the twentieth century, partly due to Pulitzer's direction to return his paper to a higher quality of objectivity in reporting. However, the era of yellow journalism was influential both in galvanizing action toward social reform to correct problems exposed by their reports, and in generating concern for standards of objectivity and accuracy in reporting. The media wields power in society, and whether it is for good or ill depends on the ethics and motivations of those involved—with freedom comes responsibility and the press are responsible to contribute to the improvement of society. The term “yellow journalism” originated during the circulation battles between Joseph Pulitzer's New York World and William Randolph Hearst's New York Journal from 1895 to about 1898, and can refer specifically to this period. Both papers were accused by critics of sensationalizing the news in order to drive up circulation, although they also did serious reporting as well and they were by no means the first to produce sensationalist accounts. In fact, journalism had been attacked for excess and sensationalism since the 1790s. The New York Press coined the term "yellow journalism" in early 1897 to describe the papers of Pulitzer and Hearst. The newspaper did not define the term, and in 1898 simply elaborated, "We called them Yellow because they are Yellow." Joseph Pulitzer purchased the World in 1882 after making the St. Louis Post-Dispatch the dominant daily in that city. The publisher had begun his career editing a German-language publication in St. Louis, and saw a great untapped market in the nation's immigrant classes. Pulitzer strove to make the World an entertaining read, and filled his paper with pictures, games, and contests that drew in readers, particularly those who used English as a second language. Crime stories filled many of the pages, with headlines like "Was He a Suicide?" and "Screaming for Mercy." In addition, Pulitzer only charged readers two cents per issue but gave readers eight and sometimes 12 pages of information (the only other two-cent paper in the city never exceeded four pages). While there were many sensational stories in the World, they were by no means the only pieces, or even the most dominant ones. Pulitzer believed that newspapers were public institutions with a duty to improve society, and he put the World in the service of social reform. During a heat wave in 1883, World reporters went into Manhattan's tenements, writing stories about the appalling living conditions of immigrants and the toll the heat took on the children. Stories headlined "How Babies Are Baked" and "Lines of Little Hearses" spurred reform and drove up the World's circulation. Just two years after Pulitzer took it over, the World became the highest circulation newspaper in New York, aided in part by its strong ties to the Democratic Party. Older publishers, envious of Pulitzer's success, began criticizing the World, harping on its crime stories and stunts while ignoring its more serious reporting—trends which influenced the popular perception of yellow journalism, both then and now. Charles Dana, editor of the New York Sun, attacked The World and said Pulitzer was "deficient in judgment and in staying power." HUNGRY, FRANTIC FLAMES. They Leap Madly Upon the Splendid Pleasure Palace by the Bay of Monterey, Encircling Del Monte in Their Ravenous Embrace From Pinnacle to Foundation. Leaping Higher, Higher, Higher, With Desperate Desire. Running Madly Riotous Through Cornice, Archway and Facade. Rushing in Upon the Trembling Guests with Savage Fury. Appalled and Panic-Stricken the Breathless Fugitives Gaze Upon the Scene of Terror. The Magnificent Hotel and Its Rich Adornments Now a Smoldering heap of Ashes. The "Examiner" Sends a Special Train to Monterey to Gather Full Details of the Terrible Disaster. Arrival of the Unfortunate Victims on the Morning's Train—A History of Hotel del Monte—The Plans for Rebuilding the Celebrated Hostelry—Pariculars and Supposed Origin of the Fire. Hearst was known to go overboard in his crime coverage: one of his early pieces, regarding a "band of murderers," attacked the police for forcing Examiner reporters to do their work for them. But while indulging in these stunts, the Examiner also increased its space for international news, and sent reporters out to uncover municipal corruption and inefficiency. In one celebrated story, Examiner reporter Winifred Black was admitted into a San Francisco hospital and discovered that indigent women were treated with "gross cruelty." The entire hospital staff was fired the morning the piece appeared. With the Examiner's success established by the early 1890s, Hearst began shopping for a New York City newspaper. Hearst purchased the New York Journal in 1895, a penny paper which Pulitzer's brother Albert had sold to a Cincinnati publisher the year before. Metropolitan newspapers started to pursue department store advertising in the 1890s, and discovered the larger their circulation base, the better. Following Pulitzer's earlier strategy, Hearst kept the Journal's price at one cent (compared to the World's two cent price) while providing as much information as rival newspapers. The approach worked, and as the Journal's circulation jumped to 150,000, Pulitzer cut his price to a penny, hoping to drive his young competitor (who was subsidized by his family's fortune) into bankruptcy. In a counterattack, Hearst raided the staff of the World in 1896. While most sources say that Hearst simply offered more money, Pulitzer, who had grown increasingly abusive to his employees, had become an extremely difficult man to work for, and many World employees were willing to join Hearst for the sake of getting away from Pulitzer. Although the competition between the World and the Journal was fierce, the papers were temperamentally alike. Both were Democratic, both were sympathetic to labor and immigrants (a sharp contrast to publishers like the New York Tribune's Whitelaw Reid, who blamed their poverty on moral defects, and both invested enormous resources in their Sunday publications, which functioned like weekly magazines, going beyond the normal scope of daily journalism. Their Sunday entertainment features included the first color comic strip pages, and some theorize that the term yellow journalism originated there, while as noted above the New York Press left the term it invented undefined. The Yellow Kid, a comic strip revolving around a bald child in a yellow nightshirt, became exceptionally popular when cartoonist Richard Outcault began drawing it in the World in early 1896. When Hearst predictably hired Outcault away, Pulitizer asked artist George Luks to continue the strip with his characters, giving the city two Yellow Kids. The use of "yellow journalism" as a synonym for over-the-top sensationalism in the U.S. apparently started with more serious newspapers commenting on the excesses of "the Yellow Kid papers." 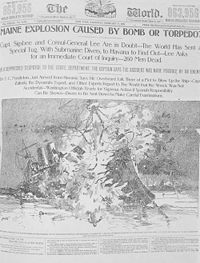 Pulitzer and Hearst are often credited (or blamed) for drawing the nation into the Spanish-American War with sensationalist stories or outright lying. In fact, the vast majority of Americans did not live in New York City. The most famous example of the exaggeration is the apocryphal story that artist Frederic Remington telegrammed Hearst to tell him all was quiet in Cuba and "There will be no war." Hearst responded "Please remain. You furnish the pictures and I'll furnish the war." The story (a version of which appears in the Hearst-inspired Orson Welles film Citizen Kane) first appeared in the memoirs of reporter James Creelman, and there is no other source for it. Hearst was a war hawk after a rebellion broke out in Cuba in 1895. Stories of Cuban virtue and Spanish brutality soon dominated his front page. While the accounts were of dubious accuracy, the newspaper reader of the nineteenth century did not need, or necessarily want, his stories to be pure nonfiction. Historian Michael Robertson has said that "Newspaper reporters and readers of the 1890s were much less concerned with distinguishing among fact-based reporting, opinion and literature." 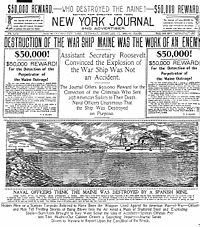 Pulitzer, though lacking Hearst's resources, kept the story on his front page. The yellow press covered the revolution extensively and often inaccurately, but conditions in Cuba were horrific enough. The island was in a terrible economic depression, and Spanish general Valeriano Weyler, sent to crush the rebellion, herded Cuban peasants into concentration camps and caused hundreds of thousands of deaths. Having clamored for a fight for two years, Hearst took credit for the conflict when it came: A week after the United States declared war on Spain, he ran "How do you like the Journal's war?" on his front page. In fact, President William McKinley never read the Journal, and newspapers like the Tribune and the New York Evening Post, both staunchly Republican, demanded restraint. Moreover, journalism historians have noted that yellow journalism was largely confined to New York City, and that newspapers in the rest of the country did not follow their lead—the Journal and the World were not among the top ten sources of news in regional papers. War came because public opinion was sickened by the bloodshed, and because conservative leaders like McKinley realized that Spain had lost control of Cuba. These factors weighed more on the president's mind than the melodramas in the New York Journal. Hearst sailed directly to Cuba, when the invasion began, as a war correspondent, providing sober and accurate accounts of the fighting. Creelman later praised the work of the reporters for exposing the horrors of Spanish misrule, arguing, "no true history of the war . . . can be written without an acknowledgment that whatever of justice and freedom and progress was accomplished by the Spanish-American war was due to the enterprise and tenacity of 'yellow journalists,' many of whom lie in unremembered graves." Hearst placed his newspapers at the service of the Democrats during the 1900 presidential election. He later campaigned for his party's presidential nomination, but lost much of his personal prestige when columnist Ambrose Bierce and editor Arthur Brisbane published separate columns months apart that called for the assassination of William McKinley. When McKinley was shot on September 6, 1901, the Republican press went livid, accusing Hearst of driving Leon Czolgosz to the deed. Hearst did not know of Bierce's column and claimed to have pulled Brisbane's after it ran in a first edition, but the incident would haunt him for the rest of his life and all but destroyed his presidential ambitions. Pulitzer, haunted by his "yellow sins," returned the World to its crusading roots as the new century dawned. By the time of his death in 1911, the World was a widely-respected publication, and would remain a leading progressive paper until its demise in 1931. The term "yellow journalism" has largely fallen into disuse as the media world has grown both in scope and in complexity. While bland "infotainment" and unethical corporate media practices may be considered "yellow" in the sense of "cowardly," the term yellow journalism traditionally refers to news organizations for which some combination of sensationalism, profiteering, propaganda, journalistic bias, or jingoism takes dominance over factual reporting and the profession's public trust. Yellow journalism is not as subtle a concept as media bias. Despite its falling out of favor, yellow journalism helped to build the place of newspapers in American life. The competition that resulted from yellow journalism was fierce and ultimately led more affordable and widespread circulation of newspapers. After the initial period of sensationalist, exploitative news the new circulation base demanded higher quality news. This led to movements for objectivity in news and greater disclosure on the part of reporters and publishers, the transparency of which were good contributions to the public sphere. ↑ W. Joseph Campbell, The Spanish-American War: American Wars and the Media in Primary Documents (Introduction). Retrieved July 9, 2007. ↑ 2.0 2.1 2.2 2.3 W. A. Swanberg, Pulitzer (New York, NY: Charles Scribner's Sons, 1967, ISBN 068410587X). ↑ 3.00 3.01 3.02 3.03 3.04 3.05 3.06 3.07 3.08 3.09 3.10 3.11 3.12 3.13 David Nasaw, The Chief: The Life of William Randolph Hearst (Mariner Books, 2001, ISBN 0618154469). ↑ James Creelman, On the Great Highway: The Wanderings and Adventures of a Special Correspondent (Boston, MA: Lothrop Publishing, 1901). ↑ 6.0 6.1 Ted Curtis Smythe, The Gilded Age Press, 1865-1900 (Westport, CT: Praeger Publishers,2003, ISBN 0313300801). Auxier, George W. 1940. "Middle Western Newspapers and the Spanish American War, 1895-1898." Mississippi Valley Historical Review 26. Procter, Ben. 1998. William Randolph Hearst: The Early Years, 1863-1910. Retrieved July 9, 2007. Rosenberg, Morton M. & Thomas P. Ruff. 1976. Indiana and the Coming of the Spanish-American War (Ball State Monograph, No. 26, Publications in History, No. 4). Muncie, IN: Ball State University. Sylvester, Harold J. 1969. “The Kansas Press and the Coming of the Spanish-American War.” The Historian 31. Welter, Mark M. 1970. "The 1895-1898 Cuban Crisis in Minnesota Newspapers: Testing the 'Yellow Journalism' Theory." Journalism Quarterly 47: 719-724. This page was last modified on 30 July 2013, at 20:20.